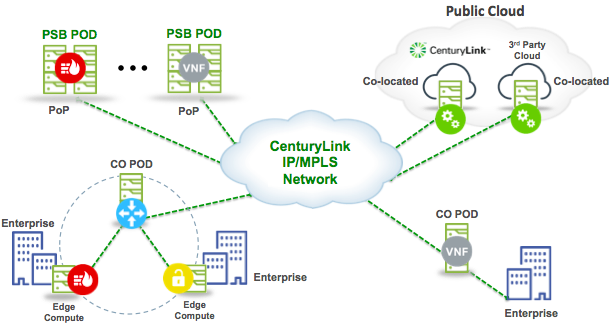 Recep Ozdag details the work the Blue Planet team is doing with CenturyLink as part of their Programmable Services Backbone (PSB) architecture they developed to deliver SDN and NFV based services to their customers. The first public demonstration of the PSB took place at MWC16 a couple of weeks ago, and is being shown again at this week's OMPLS, SDN and NFV World Congress event in Paris. Representatives from Ciena and CenturyLink will present some of the technical underpinnings of the platform in a technical session at the conference. It’s nice to be back at a smaller, more focused show such as the MPLS, SDN and NFV World Congress in Paris after my visit to MWC16. While I did enjoy my fair share of tapas and paellas at Barcelona, I am looking forward to chocolate crepes and a smaller conference. Clearly I’m going to have to exercise more than usual to burn off all the good food I’ve been enjoying the past couple of weeks. What I like about the SDN, MPLS and NFV World Congress is that it tends to be more technical than your traditional conferences, which is great for me, as I have been eager to share what CenturyLink has been cooking up with their Programmable Services Backbone (PSB) architecture that they developed to deliver SDN and NFV based services to their customers. The first public demonstration of the PSB took place at MWC16 a couple of weeks ago. We will repeat the demonstration at Paris and will have a separate technical session with representatives from Ciena and CenturyLink presenting some of the technical underpinnings of the platform. In the meantime, here are some of the features of the PSB platform. CenturyLink is one of the leading operators to embrace an open and programmable SDN and NFV platform, having started work on bringing the crucial pieces together a few years ago. The resulting architecture consists of commodity servers that can be used to deploy flavors of OpenStack as well as VMware. The virtual overlay solution (sometime also referred to as tunnels) is brought by Nuage. 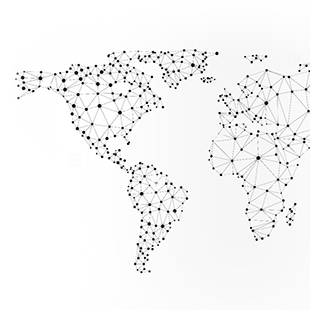 The overall architecture, including the virtual network functions (VNFs), is all orchestrated by Ciena’s Blue Planet platform. CenturyLink is planning to distribute this modular and programmable platform throughout their network by placing it in their COs, PoPs and even co-locating with their own and 3rd party data centers. 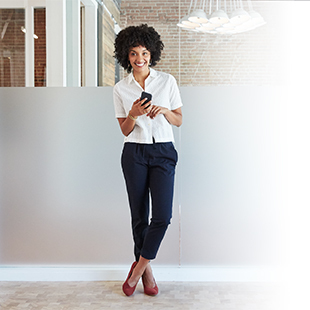 One of the features of PSB is the self-service portal where CenturyLink’s customers can not only provision connectivity services, but also provision firewall, router, NAT and numerous other managed services with a few clicks. Once the order is processed, Blue Planet will deploy the functions, service chain them, and take care of the full lifecycle service orchestration (LSO in MEF terms) until the service needs to be terminated. 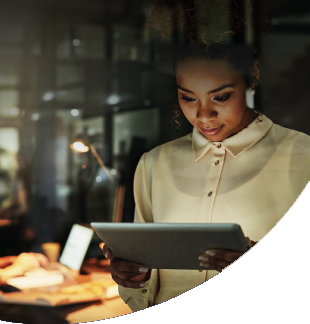 Not only is CenturyLink able to move up the value chain by offering managed services through a marketplace, but they are also able cost-effectively do so by having the ability to deploy the functions at the most appropriate location. No more truck rolls, no more proprietary network boxes… all on commodity servers with an open and programmable software stack. One of the key components of the platform that provides this unheard of programmability is Blue Planet. The flexibility stems from 3 crucial architectural properties of Blue Planet. In a micro-services architecture, an application is built using a combination of loosely coupled and service-specific software containers that communicate using APIs, instead of using a single, tightly coupled monolith of code. This development methodology makes an application easier to enhance, maintain, and scale, making it prevalent in cloud environments. Ciena’s Blue Planet is built upon a container-based micro-services architecture. Unlike the SDN and NFV solutions from large incumbent suppliers that package multiple monolithic software applications focused on individual technology domains, Blue Planet provides a vendor-agnostic and programmable software platform that is highly customizable for the network operator. Blue Planet was architected with self-service programmability and a reduced dependence on professional services in mind. It does this by leveraging model- and data-driven templates to streamline the processes associated with on-boarding resources, developing services composed of Virtual and Physical Network Functions (VNFs and PNFs), and delivering them across multiple domains, vendors, and cloud architectures. Once templates and information models are created, Blue Planet executes these ‘blueprints’ in an error-free and automated fashion, providing a repeatable and consistent, yet adaptive, deployment mechanism that includes the ability to scale, recover (heal), and terminate applications and services to cover all aspects of a service lifecycle. Blue Planet provides a highly programmable orchestrator that is not tied to any particular interface, language, or resource type. 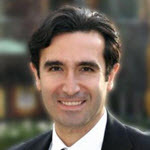 The architecture leverages a number of information models and orchestration tools such as TOSCA, NetConf/YANG, and other mechanisms for automated and dynamic deployment and complete lifecycle management of cloud and NFV applications, and to configure the virtual and physical devices that comprise the end-to-end services span. A network operator’s infrastructure is comprised of multiple technology layers and specialized domains such as cloud, metro, access, and core networks. Creating and deploying services from end-to-end in this environment is traditionally a very manual process that entails updating multiple vendor- and domain-specific element managers, SDN controllers, or orchestrators, and then integrating these changes with the back-end Operational Support System (OSS). In addition to being complex and error-prone, this service delivery model preserves the management ‘silos’ of the legacy era, making the transformation to SDN and NFV more complex and inefficient than necessary. To see CenturyLink’s PSB in action, visit Ciena’s booth or attend the technical talk titled “CenturyLink’s Programmable Services Backbone”. 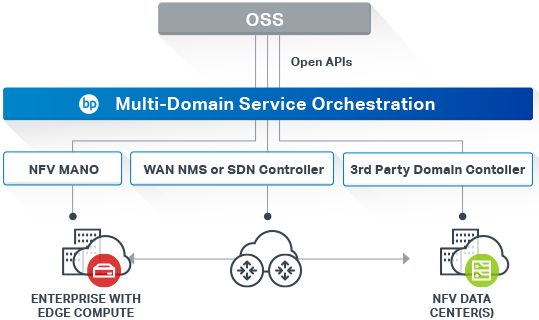 Blue Planet supports MDSO capabilities, providing an open software layer that eliminates management silos and enables network operators to automate end-to-end service provisioning and orchestration. 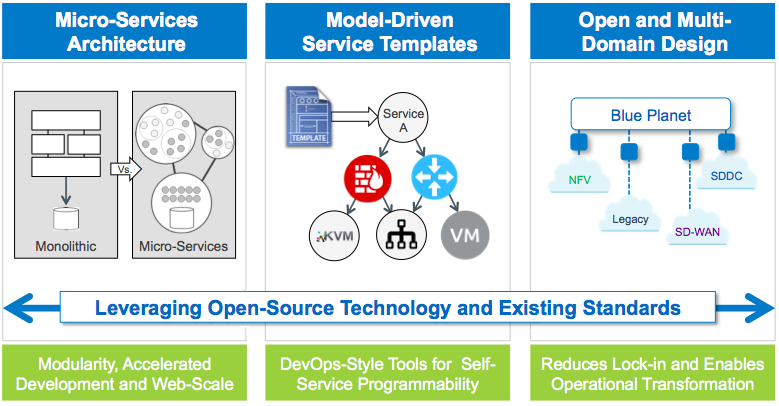 Leveraging open APIs and model-driven templates, Blue Planet integrates with third-party SDN controllers, element/network management systems, and orchestration platforms to manage and orchestrate services comprised of physical and virtual resources across multiple technology and vendor domains.